When the kind people from BC Tree Fruits wrote and asked me about contributing a recipe to celebrate February Apple Month, it was a no-brainer. Apples are obviously healthy snacks, but also super fun to bake with. My recipe index is full of crisps and tarts and caramelized concoctions - do spend a little time there if you have a sec. 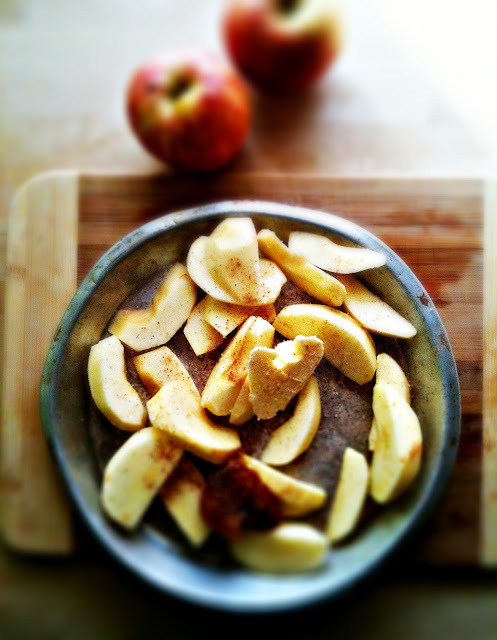 What I love most about the apple is how well it marries with butter and honey, especially when roasted. Sweet caramelization heaven. Do sprinkle them with a little nutmeg or cinnamon at the beginning (I found myself with an empty cinnamon jar - the horror!) and just a wee bit of salt. Roast until the juices reduce - about 30 minutes. It's tempting to eat them all like this, but try to save some for the French toast. A recent brunch adventure found me devouring French toast stuffed with apples and brie. It was an epiphany of sorts. My poor dining companion was locked out of my little world while I dissected the dish, wondering how to replicate such a triumph at my own breakfast table. The French toast was crispy and buttery and the middle was full of warm, creamy brie and sweet, roasted apples. They used raisin bread, but me and the raisin are not friends. 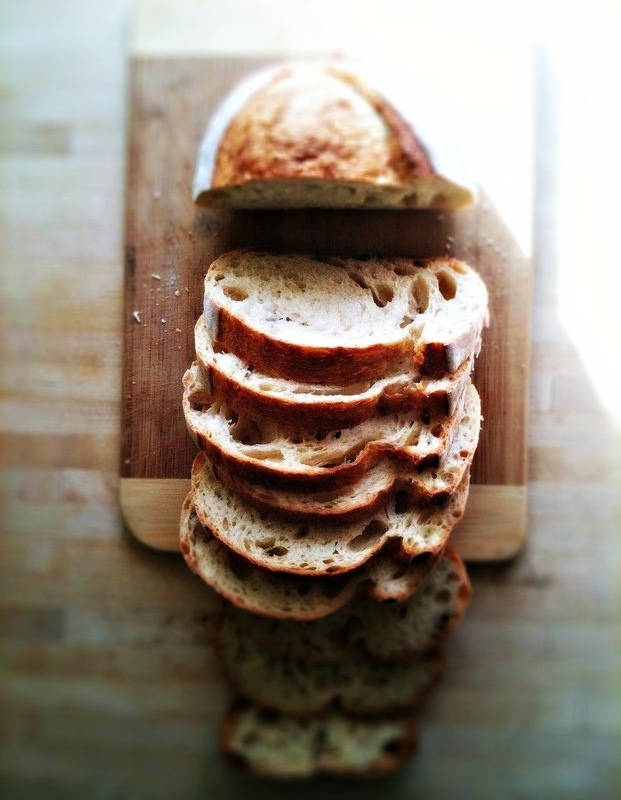 While we are talking bread, it's important to use good, toothsome French bread. Not the thick slice white wonderbread from the supermarket. It makes a huge difference on taste and general outcome. Life is too short to eat crappy bread. The procedure is fairly standard. 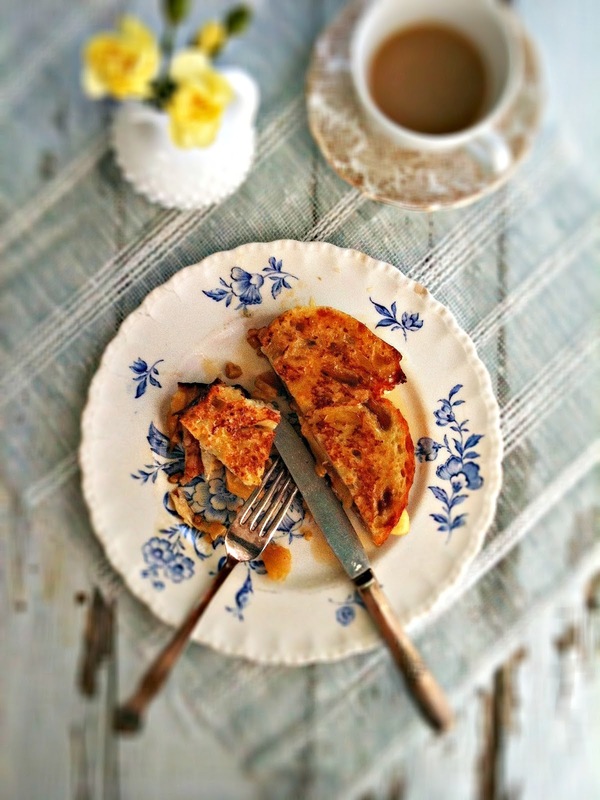 Other recipes call for assembling the stuffed French toast and then dipping it in egg. This seemed like there would be the possibility of it not being fully cooked in the middle. So my method is frying the French toast like you normally would, and once you flip it over, lay one side with brie, roasted apples and toasted walnuts - I threw those in for fun and they are spectacular. (If you don't like walnuts, go with pecans or even sliced almonds. Just make sure they are toasted first.) Once you have your stuffing assembled, lay the other side of the French toast on top and press down a little. Flip over if you like and cook on medium heat until you can tell the brie is melted. That's the key. Remove to keep warm in the oven and the repeat with the remaining piece of bread and filling. That's all there is too it. It's like a French toast sandwich! This has been one of my favourite breakfast creations, like, ever. 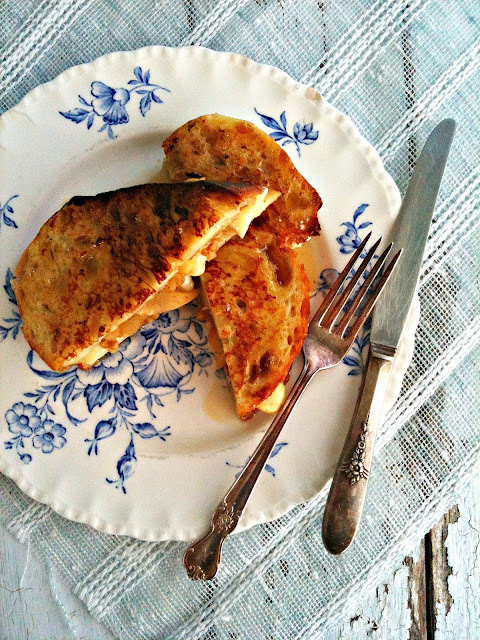 The brie is just terribly creamy and melty and the honey-roasted apples are nestled between two perfectly cooked pieces of French toast. The nuts add a little drama (plus they are good for you!) and the only thing that's needed is a generous pour of good maple syrup. If you're trying to impress someone, go ahead and add a dollop of whipped cream, but they'll still love you without it. And lastly, be sure to set a pretty breakfast table, even if it's just you. Especially if it's just you. Apples: Preheat oven to 375*F. In a small baking dish, toss apples with the butter and honey, sprinkle with nutmeg and salt. Roast for 30 minutes or until golden and soft, stirring around every 10 minutes. You want most of the liquid reduced. When done, set aside. Beat together the eggs, milk, sugar, vanilla in a medium bowl. Heat a skillet over medium high heat and add 1 tbsp butter. Dip the bread in egg mixture. Fry two of the slices, flipping over when golden. Onto one golden side, lay down 3 pieces of brie, some roasted apples and half the walnuts. Top with other side and continue cooking until brie melted, reducing heat. Remove to baking dish and keep warm in oven (turned down to 250*F) and repeat with remaining 2 slices of bread and 1 tbsp butter and remaining filling ingredients. Serve warm with maple syrup. Serves 2. This looks delicious! We are so the same. I can't bite into an apple and I am not friends with raisins, no matter how many times I try! Can not wait to make this when I get back from my retreat. I have been making French toast with the apple beer flax bread from Earthbound bakery and I am going to try this recipe with it also. I will let you know how it turns out. It is easy to see why these might be your favourite from now on Renee. Many varieties of BC apples are widely grown here in the Okanagan Valley. Tracy - now I know why we are such good friends! Jean - I think you and Wade will love this French toast. The apple beer bread from Earthbound will be perfect. Have a great time on your retreat! Val - oh I love the Okanagan Valley. I need to make a trip out there! 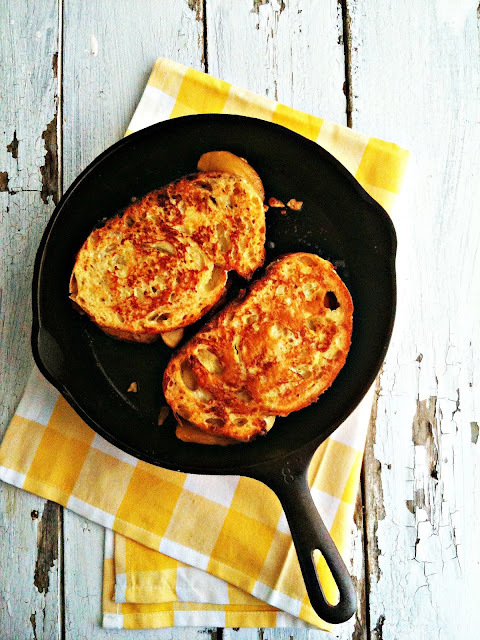 i have always been wary of the apples and cheese combination (they are so good on their own), but with your raving review... i might give this french toast a try this weekend! 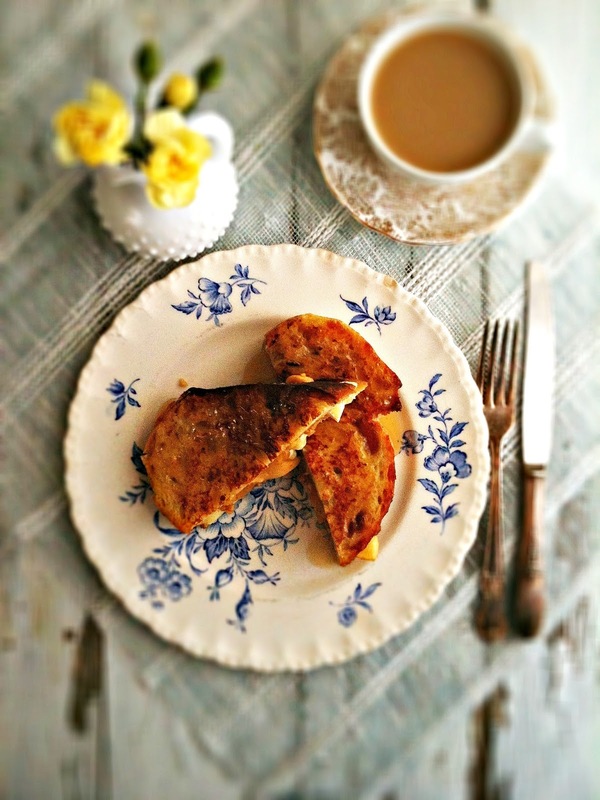 This french toast concoction looks and sounds lovely. Who wouldn't want a little brie with their breakfast? Love that you had a pet cow named Susie. Too cute! I love apples and recently made pancakes with shredded apples. 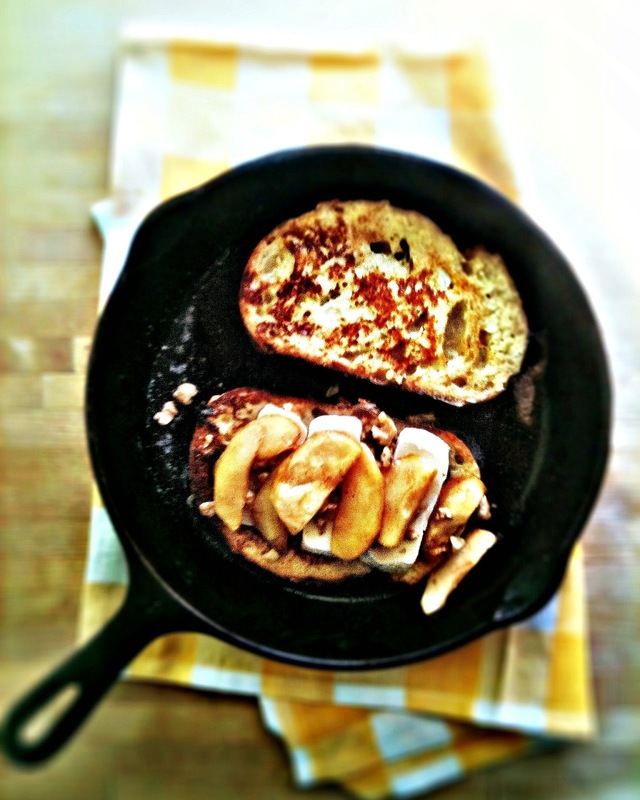 Your French toast stuffed with apples looks so delicious, I love to have that kind of breakfast on weekends! What a gorgeous and delicious looking breakfast! Hey Renee! Love this! And so will Paul. He loves Brie cheese, well all things kitchen, actually. I hear the refrain "Paul's turn" constantly while preparing anything. I am hoping to foster this love forever. Thanks for the posts and all the deliciousness. Alley - apples and cheese are magic. Do it! Julia - thank you so much! Amy - it's really great cold weather food. Paula - thank you! I love a good breakfast on a lazy Sunday. I am all for markers that smell like fruit!